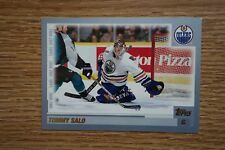 Up for your consideration is a 2002-03 Upper Deck, "Mask Collection", Tommy Salo "View from the Cage" jersey card. It is card # V-TS in the set. It features a white color jersey piece. See scans for condition. 2001-02 BAP SIGNATURE SERIES AUTOGRAPH #LTS TOMMY SALO SP ! !